This photo tweeted yesterday by AP writer John Zenor show that portions of the base of the Toomer’s Oaks appear to have been scorched. The Toomer’s Oaks have made it through the flames before, but Sunday morning’s fire was the first the trees have endured since being poisoned in late 2010. And they apparently didn’t endure it very well. 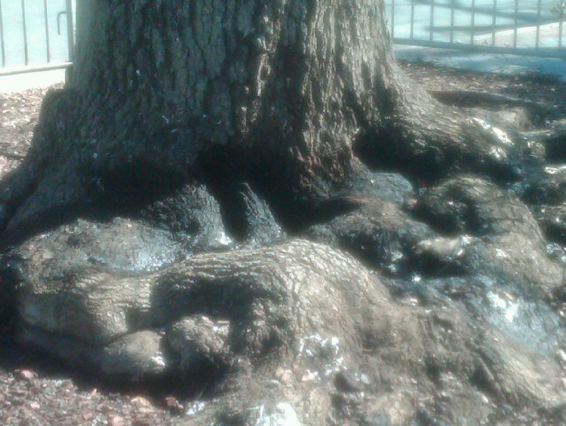 The Oaks at Toomer’s Corner were damaged by fire early Sunday morning. Members of the Trees Task Force examined the trees Monday morning and found significant damage to both oaks and to several plants adjacent to the plaza. The Trees Task Force will post an update about the fire damage next week. The Auburn Police Division is investigating the incident. Sunday’s incident was the second time in just over two years the oaks have caught fire after being rolled. The blaze that engulfed the toilet paper left in the trees after the 2010 Auburn-Georgia game was actually the result of three separate fire incidents. The oaks also caught fire after the 2007 Iron Bowl (video). My guess is that the damage is due to the small (highly flammable) jungles that have been allowed to grow at the base of each tree. My guess is that it is due to the small brain of the person who lit the fire. Fire is another reason to replace these trees with some indestructible permanent memorial trees. Regardless of what we put back, we need to install some overhead irrigation / fire suppression for the safety of all. There seems to be no shortage of idiots/pyros/what-have-you that are willing to do something to Auburn’s oaks. We live in awful times where it seems that Alabama’s resident poisoner gets away with his crime. What deterrent is there to stop the next? The court system of Alabama sits silent and broken. Or you could just plant real trees and find something else to roll.